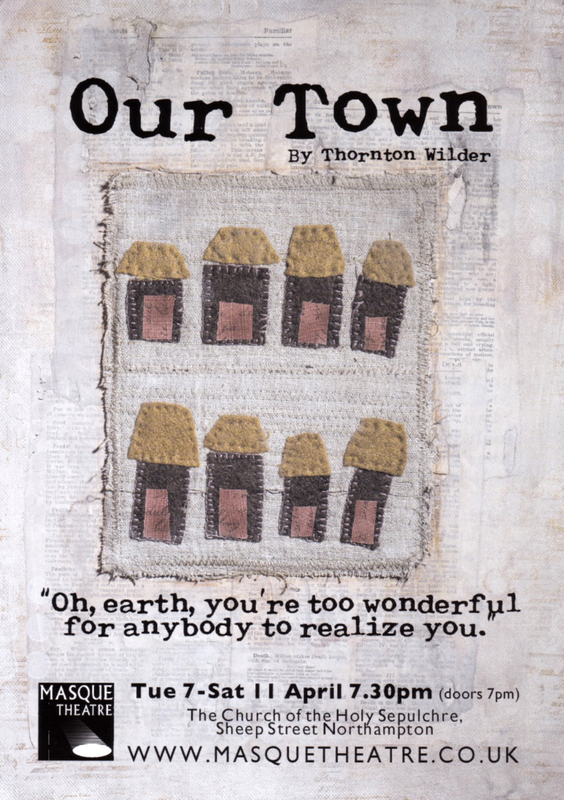 Thornton Wilder's Our Town is one of the most famous plays in American theatre and has been performed regularly throughout the world since its first performance in 1938. It is set in a small town in the States at a time before WW1 and describes the lives, loves and deaths of the townsfolk. Nothing especially remarkable happens but what set the play apart was its innovatory style, with bare minimum of props and scenery, miming of action, and a central figure, the ‘stage manager’ who addresses the audience directly and acts as narrator. Its deceptively simple plot, style and large cast have made it particularly popular with amateur companies, though there are potential pitfalls unless effectively performed. These can include dodgy accents, inept miming and an inability to dilute what can seem like a ‘folksy, cracker-barrel’ philosophy. Fortunately here these unwelcome features are intelligently avoided and Director John Myhill and Producer Jo Molyneux have done Masque Theatre proud. They have followed absolutely the style and spirit of Wilder's original play. The minimalist aspects were actually enhanced by the venue: Holy Sepulchure Church, and throughout the performance carefully chosen music, sound and lighting added unobtrusively to the overall effect. The importance of the hymn Blessed Be The Tie That Binds in the context of the play is underlined by cleverly repeating the verses at key points in the drama, sweetly sung by the ‘town choir’ (conducted by a noticeably intoxicated choir-master, even with his back to the audience!). 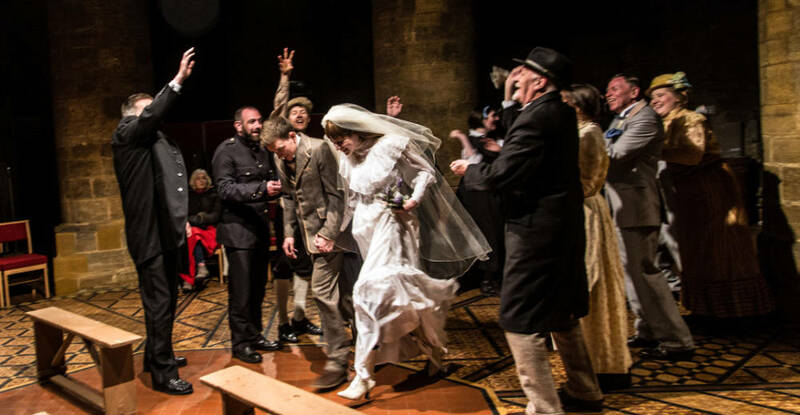 Above all, John and Jo had assembled a strong cast of actors able to do justice to the many characters: such as the town doctor, the milkman, the town drunk, the newspaper editor, the the policeman, the undertaker, their wives and children. These were together with a welcome sprinkling of some new to the company. All of the actors got the most out of their roles, but special mention should be made of the three leading players, Ian Spiby, Rebecca Allan and Charlie Clee. Ian, as the ‘stage manager’ was masterly in the way he related to the audience in such a naturalistic, sincere, often humourous, knowing, wise and warm way. His performance was the rock on which the whole play was so effectively built. Rebecca and Charlie had great chemistry together as George and Emily, who we first see as children, grow,through the inevitable ups and downs of abudding relationship, to mutual love, and then to marriage, one, alas, all too briefly short. 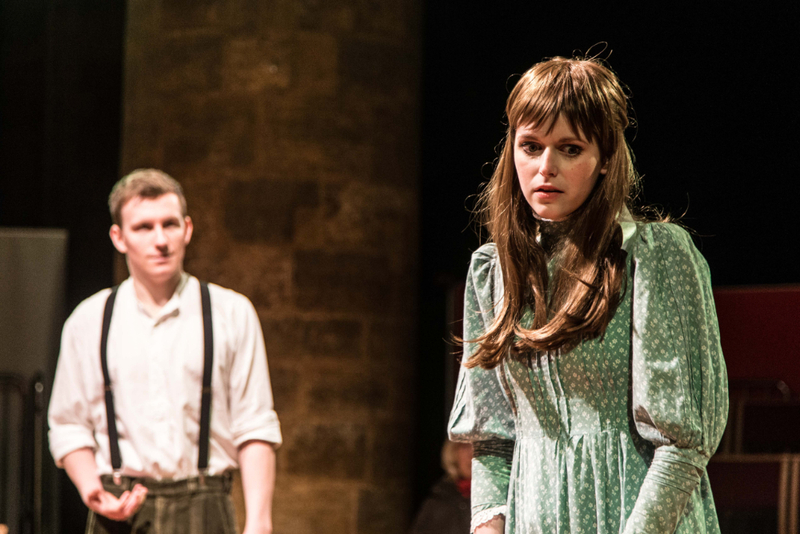 At the end of the play, Rebecca's performance, as Emily speaking from the grave, was impressively powerful and deeply moving: ‘not a dry eye in the house’ as the old saying goes. Before we started rehearsing Our Town, I did wonder how wise it was for my Masque directing debut to be such a large cast play, albeit with the compensating lack of scenery and props to make things a little easier (there‘s a lot of miming!) - but I needn't have worried. For this play I have an enthusiastic, dedicated and talented group of people who, to my amazement, appear to be willing to listen to me and even more amazingly take my suggestions on board. Not that it's all one-way. When I started mentioning the play to people in hopes of generating interest, I was surprised how many people not only knew it but knew it well, and had long standing ambitions to be in it. I've been very pleased to be able to fulﬁl those ambitions, and to lean on the understanding and alternative interpretations of parts of the play from members of the cast. Although the ultimate directorial responsibility is mine, it's been very much a collaborative experience, one which I hope they have enjoyed as much as I have. So what's it about? Thornton Wilder wrote Our Town in the late 1930s, a time of uncertainty, about small town America in the pre-Great War 1900s when life was simpler, but it's not just a nostalgic reminiscence, although there are elements of that. It's as much about the universality of experience, and the similarities in the daily lives, loves and losses of ordinary people in ancient Rome, 1900s or 1930s America, modem day Northampton or even colonists on far ﬂung planets a thousand years hence. It's a time capsule that says ‘Here, look, this is what our lives were really like at this point in time. Here are the differences, but here also are the essential similarities.’ lt’s about etemal truths. It's also, in case that scares you away, a love story about childhood sweethearts George and Emily, beautifully played from youth to adulthood by Charlie Clee and Rebecca Allan. There’s light hearted comedy about small town life, marriage and families, with Owen Warr and April Pardoe as George’s parents Doc and Mrs Gibbs, Victor Guse and Bev Webster as Emily’s parents Mr & Mrs Webb, newcomer Emily Whitehouse as George’s sister Rebecca (and yes, having an Emily playing a Rebecca and a Rebecca playing an Emily has been a little confusing) and Oliver Macken as Emily’s brother Wally. Narrating and orchestrating the play from onstage is the character of The Stage Manager’, played by lan Spiby with gravitas and lightness of tone by turns as the play weaves its way through comedy, romance, tragedy and even philosophy. A supporting cast of local characters (milkman, policeman, undertaker, paperboy, local gossip, drunken choirmaster etc.) are brought to life by a mixture of my favourite ‘usual suspects’ like Kevin Pinks, David Chappell, Lisa Shepherd, Peter Collins and Tony Janney and welcome newbies like Drew Fisher, Allan Martin and Jof Davies. To complete the list we have a small chorus of ‘extras’ and as a demonstration of the strength of the cast I'm very lucky to have Jen Kenny, Rosie Chapman and Tamsyn Payne in such small but hopefully rewarding roles — it's not often you get to play someone dead, after all! We've also got an additional chorus of imaginary chickens and a horse called Bessie. Thank you to everyone who has helped with the play, especially Jo Molyneux as producer (her presence has always given me conﬁdence ever since working with her in The Hypochondriac) and Clare Brittain for helping with costumes whilst also preparing for her own show Amadeus, and to Rob Kendall and Matt Fell for timely advice and support. Do come and see it and be prepared to laugh, to sigh, to think and to cry. Trust me, you will. This is the first play John Myhill has directed for Masque Theatre. Masque Theatre is one of Northampton's most vibrant and longest established amateur theatre groups. We welcome new members. Masque Theatre rehearse at the Burns Street Studios, 9 Burns Street, Northampton NN1 3QF. We perform at venues around Northampton.